Preservation of Community Assets: Paint It White? Why do some people insist on ruining perfectly beautiful architecture? 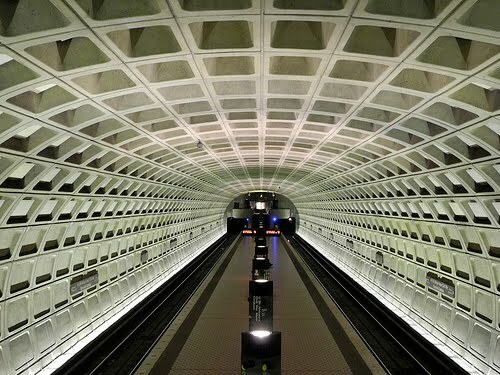 The reason why yours truly is asking is Washington D.C. metro rail stations are home to some of the spectacular examples of Brutalist architecture. Regardless of what you may think of the genre, there is a certain appeal to it. So why would anyone want to cover it up? This is subject Kriston Capps ponders in his CityLab article "Keep Metro Bleak!" The Washington Metropolitan Area Transit Authority seems to think that the soaring coffered vaulted ceilings need covering up. This stunned Bill Gallagher, principal for KGP design studio. Shall we find out why WMATA wants to paint the vaults gleaming white? Mr. Gallagher has a genuine affinity for the Metro rail stations. As a newly graduated architect, his first job was designing the station. He started work in 1976, the same year Metro rail opened with five inaugural stations. Everything else was still being built or on the boards of Metro's late architect, Harry Weese, Mr. Gallagher's first supervisor. It was just unbelievable...Absolutely shocking. Martin Moeller, senior curator for the National Building Museum, was equally aghast. WMATA painted the Metro vaults once before-at Farragut North Station-in 1992, for example, that moment caused a fuss. Mr. Capps writes, The Farragut North job was a light gray, Moeller recalls, close to the color of concrete." Okay, it is just paint, right? Well, that paint took the WMATA in-house design team by surprise. Left out of the decision process to paint the Brutalist vaults white were Metro's chief architect Ivalio Karadimov or chief architectural historian Jeff Winstel. Messrs. Karadimov and Winstel were not even aware it was happening, an anonymous source, not authorized by WMATA, told Mr. Capps. In an aside Mr. Capps writes, "A spokesperson there could not confirm or deny the claim. What might seem like another eye-rolling moment for (most) Washingtonians was a cause for serious consternation for designers, historians, and fans of the Metro's beloved Brutalist vaults. While power washing was considered, years of dust, dirt, and grime coating the vault cannot effectively be cleaned and does little to move the needle when it comes to brightness. Especially this station. It's going to be filthy within weeks. Painting the station is also an anathema to two different efforts by WMATA. First, the agency is working with our friends at the U.S. National Park Service and the General Services Administration to find a more efficient way to clean the exposed concrete. FortunatelyWMATA has no other plans to paint the other Metro vaults, making Union Station a one-time job. Oddly, WMATA is also planning to submit to include Metro to the National Register of Historic Places-a designation that would override any renovations. ...expressing our deep concern regarding WMATA's decision to paint the interior of the Metro Stations [sic] bright white. 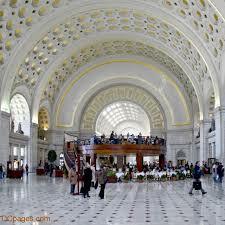 significant alterations to Metro stations in Washington D.C. It is very easy to miss some of the more elegant details. 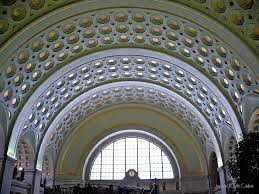 Mr. Capps writes, "Deep coffers that run between the ribs of the vaults-the coffers are structural, not decorative components-are mirrorred by the shape of the windows on the older-styles Metrorail trains." Popular opinion has not been kind for a variety of reasons including top-down neglect. 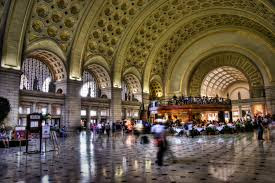 Rather than rehabilitate Harry Weese's designs, something that WMATA attempted and failed at before, the agency could have simply power cleaned Union Station. It is already modernizing the lighting with technology not available in the sixties when Mr. Weese's (and lighting designer William Lam) first drew up plans for the stations. 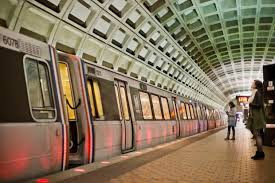 According to Mr. Gallagher, "Simply 'relamping' its Metro station...WMATA can brighten murky platforms, bring down costs, and expand the maintenance window for lighting from every 2 years to every decade. 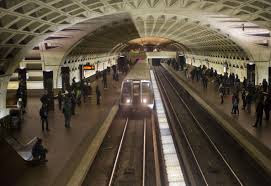 (That would be be a better use of the agency's energy,...)"
Bill Gallagher continued, "Exposed concrete was key to the kit of parts that Weese designed for Metro. He use a limited palette of durable yet warm materials." Among the palette of material was quarry tile, granite, bronze, and brown paint (good for concealing rust on trains). There are no columns so passengers can see their path of travel. Indirect lighting allows people to always see faces around them. Not every one of Harry Weese's concepts were so flawless. "The bronze elevators were dark and confining. (Gallagher's firm replaced the one at the Rosslyn Metro Station with a more inviting glass elevator)." The outsized kiosks are a forbidding obstacle that separate the station operators from the passengers. For the all the flaws, Metro's warmth and soaring vaults are probably one the few good things about Washington D.C. right now. Harry Weese was a very fine architect, and he did quite a few buildings, many of them interesting and whimsical...Ironically, it was when he did the Metro, where he had the weight of all these commissions and bureaucracies to deal with, that he somehow managed, along with everyone else involved, to create this system. It is easy for commuters not to pay attention to the remarkable visual achievement of the Metro. Especially when it is busy or they are trapped at the Rosslyn Station, waiting to be packed into a train car like sardines, or cursing all the way to or from a sports event. However, if you happened to attend a local photography exhibition, try to find an image that does not included a blurry train against the backdrop of one of Harry Weese's majestic structural vault. You will not. WMATA can ill-afford to take Metro for granted. The agency has more pressing concerns on its plate than cosmetic repair; allowing for aesthetic concerns, WMATA seems to have powered ahead without consulting with designers. This impulsiveness has blown up in WMATA's face over the years. Strangely, WMATA thinks it found a problem where there was not one, Harry Weese's design.